Sometimes life takes you by surprise. Even when you knew it was a possibility, it still catches you off guard. Then it is up to you to figure out how to move forward. That was my Friday night at 10pm. And yes, it still shocks me even as I write this. I won the Girl Scout Recipe contest! I couldn’t believe it, and still can’t. I had such strong competitors! But in the end, I think it came down to my daughter’s marketing plan. And yes, at age 12 1/2, she definitely succeeded. At 10pm on Friday night, already in bed, I frantically rearranged my Monday morning schedule, because as a winner, I get to make my recipe on television – which just happens to be filming tomorrow morning. So thank-you to all of my readers who voted, every vote counted, and from what I heard – it was an extremely close race. Now for the really fun part! As I mentioned previously, I plan to donate my prize winnings to a charity. Which charity? Well, that is up to you. Please leave me a comment on this blog post of your favorite charity, and I will select one randomly that will receive the donation. 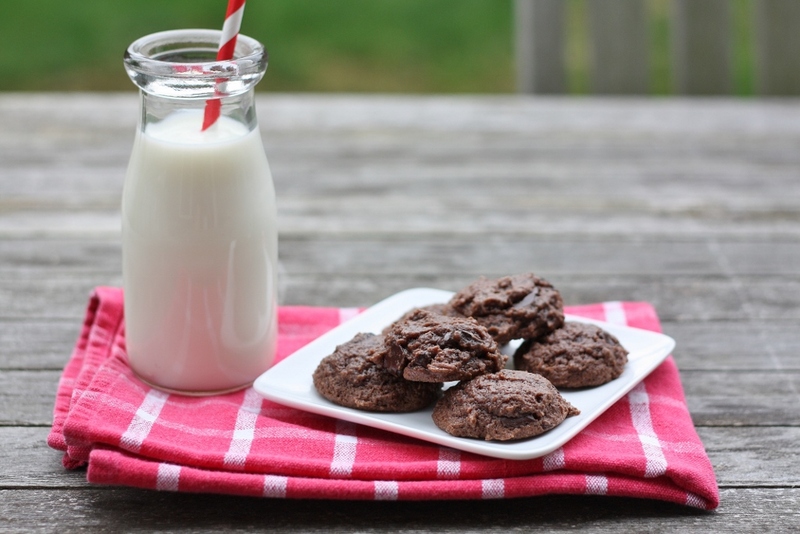 Speaking of cookies, I leave you with this recipe for Double-Chocolate Cookies, which I found in Cooking Light. They were super easy to make, and were a huge hit with my daughter and her friends – they are particularly good right out of the oven. It is important not to bake these cookies to much, you want them to be soft and chewy. Ok, so maybe they are not as good as Samoas, but hey, you can make these all year long – and you only have a few more weeks to get ahold of those Girl Scout Cookies!! Weigh or lightly spoon flour into dry measuring cups; level with a knife. Combine flour, cocoa, and salt in a bowl, stirring with a whisk. Place sugar, butter, and oil in a bowl; beat with a mixer at medium speed until well combined (about 5 minutes). Add eggs, 1 at a time, beating well after each addition. Add vanilla; beat 1 minute. Add flour mixture to butter mixture, beating at low speed just until combined. Add chocolate; beat at low speed just until combined. Cover with plastic wrap; chill 30 minutes. Drop dough by 1 1/2 tablespoonfuls 2-inches apart onto baking sheets lined with parchment paper. Bake at 350° for 8 minutes or until almost set. Cool on pan 2 minutes or until firm. Remove cookies from pan; cool on wire racks. Way to go Dawn, that is so awesome!!!! Cannot way to try these. Congratulations on your well deserved win Dawn! How do we get to see you on TV?? I think you should donate the winnings to a local food bank. Hooray Dawn! You and your pie are amazing! Please consider donating the prize money to The Pancreatic Cancer Action Network; http://www.pancan.org the national leader in pancreatic cancer education, support and research. Pancreatic cancer will be THE deadliest cancer by 2020, as its victims have only a 3-5% chance of survival at five years, most die within a few weeks or months of diagnosis. There are no clinical tests at present to discover the disease and most sufferers learn of their situation at the end stage of the cancer. Its a death sentence. PANCAN was instrumental in forming the Congressional Caucus on the Deadliest Cancers and works to fund research to improve identification and treatment for all cancers. My mother was terrified when she was diagnosed and we want others to have more hope than she was offered. Congrats Dawn! I can’t wait to try making these cookies. Imerman Angels is a one-on-one cancer support non-profit that I love. Congratulations!!! My favorite is the Fisher House Foundation. It is like the McDonald house but for our military that are wounded and it supplies a place for the family to stay while he or she is in the hospital, and if he gets to get out a day then he could stay there also. I do believe we really need to support or military, they lay their life and limbs and whole body on the line for us. I recommend that you contribute to Maazon, an organization that supports the hungry all over the U.S. Your winning cookie recipe can symbolize the need to help the hungry. I always find it to be such a contradiction for me – my total love for food and the thought of millions dying of hunger around the world. It may be an apt donation.